20 October 2014 found me painting in late afternoon sunshine on the north bank of the Assiniboine River at Long Plain First Nations Reserve, southwest of Edwin, Manitoba. I sit on a rock amidst short grassy Carex, about 2 metres above the current water level, my feet making prints in the damp mud growing with scrambling Knotweed, at the edge of a small stand of reed-like Sandbar Willow. My painting spot is 5.56 km upstream of where the Energy East route would cross the river. The Highway 305 bridge is downstream to my right, the muddy prairie river sweeping beneath it, still in flood conditions after this summer's heavy rains. Cliff Swallow nests encrust the vertical concrete of the outside of the span in the middle of the bridge, with circular mud-marks of nests that have fallen from other sections of the span. Fred has come back from looking around upstream, and is perusing the sandy mud bank opposite me, moving in and out of sight in the tangled river-edge forest of tall autumn-yellow Ash trees. Three Greater Yellowlegs fly peeping noisily up from the waters edge as he scans the mud carefully for mussel shells, finding only a single small worn-down fragment. When we arrived we crossed the bridge to the south shore, and with no gravel or sand bars in sight anywhere on the deep clayey prairie river with its sandy forest shores, we didn't expect to find many mussels. Even TransCanada Corp. recognizes the occurrence of the COSEWIC-Endangered Mapleleaf (Quadrula quadrula) here, so the mussel fauna would be very exciting if it were accessible. The magnitude of the recent flood is told by logs lodged right up under the bridge span. We saw Great Blue Heron and Beaver tracks on a little nearly offshore bar around the southernmost pier and Mink and Domestic Cat tracks in the mud of the bank, but we were most thrilled to find relatively recent drift of twig and bark fragments between round stones used to armour the bridge footings, which was relatively rich in tiny snails shells. As I settled in to paint, Fred wandered upstream on this shore of the river, to where the bank became a vertical clay dropoff. He went past clumps of Water Smartweed on the exposed shore and among Willows, and American Licorice on higher levels. Field Horsetail, flattened by the flood, formed a crunchy mat under the reed-like Sandbar Willows which Beavers had been cutting to drag into the river for their winter food supply. Then he messed around upstream of the bridge on the far shore, heading upstream across the sand-swept and ATV-tracked flats to the source of a flood channel. The head of the channel was interesting mostly for what it wasn't – there was not much if any lowering of the bank where the overflow originated: the water just went over the bank about 3 m above current water level and flowed across what is now a sandy tumult, with Ash seedlings, Cockleburr, scattered clumps of Reed Canary Grass, and single stems of Common Milkweed pushing through the sand. Coming back downstream through a woods of Ash, Manitoba Maple,White Elm, and Cottonwood he found the ground was again tumultuous with swept piles of sand and coarse woody debris. 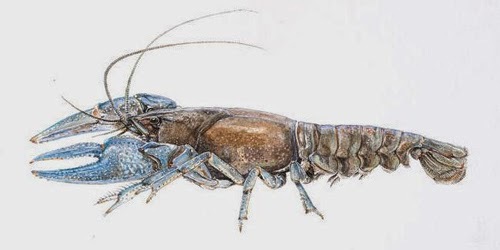 Two falling-apart Orconectes virilis (Northern Crayfish) shells were the only animate aquatic productions. I lost sight of him among the trees as he climbed the bank from the narrow beach across from me. The flooding hadn't left much for him to find, but he noted our westernmost Ostrich Fern on the brink of the bank 3.5 m above current water level, the Brassica Mustard of which we took a specimen at Fort McMurray (small plants with tasty leaves), and a Hairy Woodpecker ringing various notes from the dead trees in his territory. Fred returned with a few huge leaves from an Elm sapling, and one small creamy mushroom cap near ground level of our favorite edible species Hypsizygus ulmarius (Manitoba Maple Knothole Oyster) which we've been expecting to reappear as we travel back east. Re-crossing the bridge on foot he added another Mammal observation - a juvenile (White-footed Mouse) freshly pancaked at mid-span. I had made good progress on the painting, but had to pack it up unfinished to hurry east – next day the Red River in Winnipeg, and then appointments at Shoal Lake and Kenora.